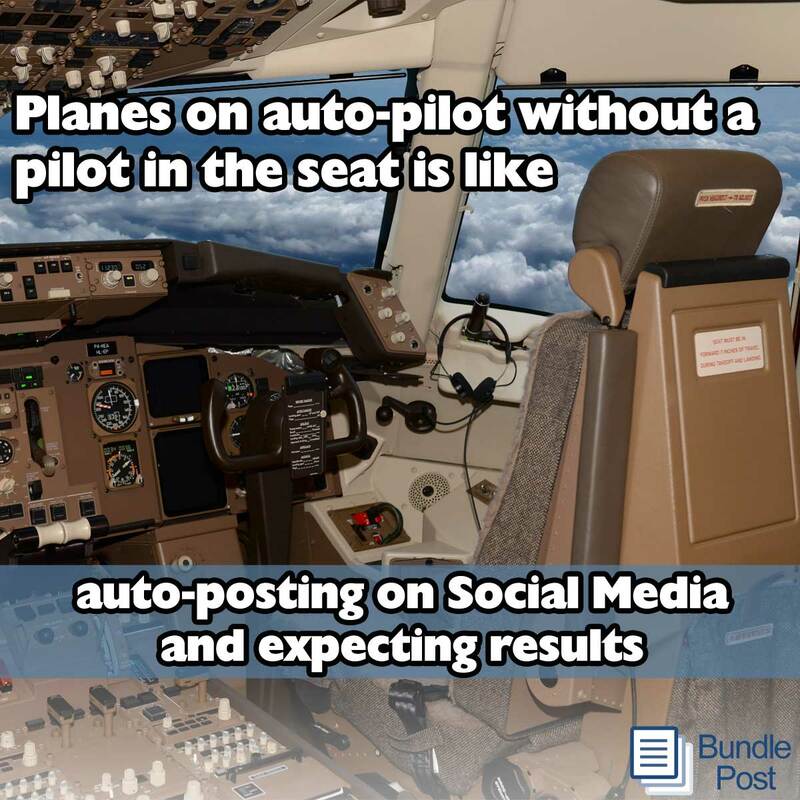 This last week we had a BundlePost user state that they wanted their social media marketing on “autopilot” and thought that’s what we did or advocated. Nothing could be further from the truth. Marketing automation and the term autopilot have no relation to one another in social media marketing. One is a carefully thought out and actively managed strategic component of an effective social media program, the other is liken to a drone with no pilot, mission or results. In the commercial aviation industry, millions of dollars are poured into the avionics and systems that keep aircraft in the air, comfortable for passengers and controllable by highly trained pilots. These systems are all integrated together to make the function we all know and understand as autopilot, possible. But what we never see is a plane placed on autopilot, without an experienced captain monitoring all aspects of the controls. Pilots would never put their plane on autopilot, leave their seat and subsequently allow the plane to cruise unattended. Not only is that illegal and against all common sense and regulations, but it’s incredibly foolish and would be an accident going someplace to happen. On the contrary, there are two pilots in every commercial cockpit even though autopilot capabilities are on board. Both professional pilots are present, strapped in their seats and always ready and able to respond to any circumstance that arises. Autopilot was never developed or designed to fly an airplane unattended, nor was it ever meant to be used as something to replace an experienced pilot. Advanced technology is designed to help efficiently manage some mundane human tasks, freeing up the pilots to ensure a smooth flight and potential problems or opportunities. Let’s put some clarity to the differences between these two distinctly different marketing approaches as it relates to social media marketing. We will give six examples of each and provide a little detail as we go. Social media success does not appear by accident, or via automation, rather it can only be achieved through consistently executing proper strategy, activities and human interaction. 1) Auto-posting content from any source – This is not strategic, safe or effective. 2) Auto-tagging and posting messages – This includes things like newspaper posts that tag people you’ve automatically displayed on your Rebel Mouse or other newspaper pages, “top influencers tag messages” or any other similar tools or systems that auto-post to your pages, profiles or timelines. They are clearly automated, provide ZERO value to anyone (including yourself) and most people know this. 3) Automated Timeline or Direct Messages – We all know these are automated and not sincere as a result. We ignore not only the message you have automated, but we will likely ignore you hence forth. 4) Automated Retweet applications – Some of the newest horrid autopilot technology is the automated RT app. This little gem lets you select specific people/accounts and it will automatically RT their tweets at specific intervals. This is like an accident going somewhere to happen. It’s not effective, don’t do it. 5) Automated Pitch Tagging – We just connected (or have no relationship) and your autopilot solution tags me to pitch your link, blog, website, product or service. Have you ever wondered why email spam is now illegal? You’re doing the equivalent on social media and your brand and results will reflect it if you don’t stop. In fact many (including myself) report accounts that do such spamming, every time it happens. Wonder why your account gets suspended? Now you know. 6) Automated Engagement Posting – Imagine going to a networking event and when you introduce someone to somebody else, or tell someone about another persons book or product, the person you were referring to, took out their smart phone and played a recorded message. Or better yet, imagine that you were having a conversation with someone and a person or brand you’ve never heard of, jumped in to the conversation to tell you about their product all because he overheard you mention the word “fruit”. Whatever you would do in real life, you should do in social media. Whatever you would never do at a networking event or walking down the street, don’t do in social. It’s not more complicated than that. Autopilot does not get real results in social media and will damage your reputation. Consider this: If you and thousands of others are using such autopilot tactics in their social media marketing and hundreds, if not thousands are connected the same people, your autopilot tagging and posting are also appearing to the same person. What do you think the impression of your brand, product or service is when your automation is just like everyone else’s automation and being seen by the same person? I can tell you. You just became a brand or person they will not be doing business with. If you expect to get results there are a few social marketing automation functions that you need to be doing. Liken these activities as the aviation autopilot explanation we discussed earlier. You, the pilot are always there in the seat, but the plane’s autopilot can be running these functions for you. 1) Landing Page, Lead Capture, Email Drip Campaign – If you are using social media for marketing and do not have a clear marketing automation path for your prospects, you are undoubtedly not achieving the results you should/could be. Understanding your prospects click-through, registration and sign-up/order flow is extremely important and requires sales automation to be most effective. 2) Content Curation Scheduling – You must have enough relevant, valuable content in your social streams every day. It’s part and parcel effective social media. I am not referring to Retweeting or sharing other people’s curated content, but discovering and posting content that resonates with your audience. Though you should sometimes RT and share, you need to build thought leadership around the topics that drive your audience, and that requires you to aggregate and curate content they want. Scheduling these posts is a requirement, unless you have unlimited time and aren’t going to do the things that actually get results, like having conversations and building relationships. (I am being very sarcastic here. You must engage with your community if you expect results) You can either spend time posting content, or engaging and driving ROI from your efforts. Content curation scheduling is imperative! 3) Community Growth Targeting – Using tools that will help you identify your target audience and connecting with them enables you to grow your community and leverage the Social Media Connection Cycle. Finding and connecting with your customers and prospects across the social graph is extremely important. Doing it manually is cumbersome and extremely inefficient. 4) New and Evergreen Content Scheduling – When you create content in the form of blog posts and articles, you need to share that to your streams so your audience is aware. Posting it once is pointless, so you need to strategically schedule new and evergreen content multiple times when it is created as well as on an ongoing basis. 5) Scheduled Marketing Messages – If you have knowledge of something you will be doing on a specific day/time, scheduling your status update about it ahead of time makes perfect sense. Periodically scheduling marketing messages about what you do, that link to your landing pages (without tagging anyone) is appropriate and efficient. If you have done your other social strategy and activities effectively, you will earn the right to do so and people will read, click and share them. 6) Scheduled Graphics – If you are creating and posting graphics and photos to various social sites, you will want to ensure that you’re being consistent and frequent. You can’t be at your desk all the time and you shouldn’t be spending desk time doing such manual tasks. Scheduling this kind of content to your various social accounts is efficient and appropriate. There is a massive difference between social media marketing automation and autopilot. You need to know the difference and stop sheepishly replicating the activity other people are doing, when most of them are as broke and ineffective with their social media results as you are. Stop being part of the blind leading the blind and start understanding social media for what it is, not how the popular majority are using it (unsuccessfully). If you’re going to replicate what someone else is doing, you had better be darn sure that it is actually effective on the dollar and cents level and more importantly isn’t hurting your results instead of improving them. Terrific post, Robert. Great to hear the Mayday on the autopilot! This is very much appreciated – thank you. I wonder how many Twitter accounts are just robots following and linking to other robots, mistakenly thinking THOSE robots are actual people. Hmmmm. What’s worse is the non-robot accounts (most of all social media accounts) that use autopilot “robot” technology they see everyone else using and think they are actually getting anywhere meaningful. Far worse of an issue in this industry right now.